Liadh Ní Riada has been selected as the Sinn Féin candidate to contest the Presidential Election next month. She said the campaign will provide an opportunity to debate how the country has changed over the last seven years and to set out a vision for the next seven. Ms Ní Riada said her candidacy is a game-changer in this election race. "I believe the highest office in the land should be subject to electoral mandate," she said. During a party rally held near to Croke Park, Ms Ní Riada repeatedly highlighted the themes of "a united Ireland", reconciliation, cultural identity and equality. 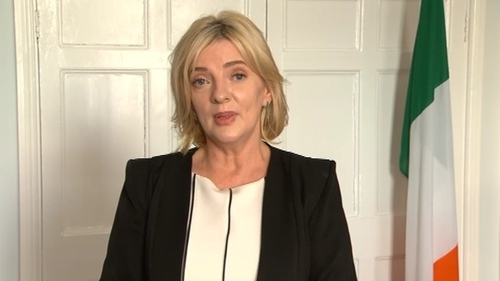 The Ireland South MEP said the loss of both her parents at a young age had given her a strong sense of independence and an empathy for those who are suffering. She said her vision is a humanitarian one that values the dignity of individuals and does not look away from injustice. Ms Ni Riada said she wanted to be a "new president for a new Ireland". "Ireland needs an energetic president to support and encourage this journey", she told supporters. Ms Ní Riada said that if she was elected president she would seek to have an inclusive conversation among citizens about a future united Ireland. She said that the past seven years have witnessed the ending of many of Ireland’s certainties, and partition too would be overcome. Meanwhile, Independent TD Michael Fitzmaurice has said a group of Independent TDs will meet this week to discuss nominating a candidate for the presidency. Speaking on RTÉ's The Week in Politics, he said names will be brought forward to the meeting and he wants different candidates brought in to outline their vision. He said these include declared potential candidates and one person who has not come forward yet but spoke to him on the phone about their interest in running. He accused Fianna Fáil and Fine Gael of shutting down democracy and said Independents are trying to give people the opportunity to stand in what he would call "new politics." President Michael D Higgins, businessman Sean Gallagher, Senator Joan Freeman and businessman Gavin Duffy are already in the election race. Several other prospective candidates are still seeking endorsements from local authorities to run in the election. They need the backing of four councils or the support of 20 members of the Oireachtas to secure a nomination. The closing date for nominations is 26 September. A sitting president can nominate themselves to seek a second term and President Michael D Higgins has already indicated that he intends to run. The election is being held on Friday 26 October. Who's in the race for the presidency?